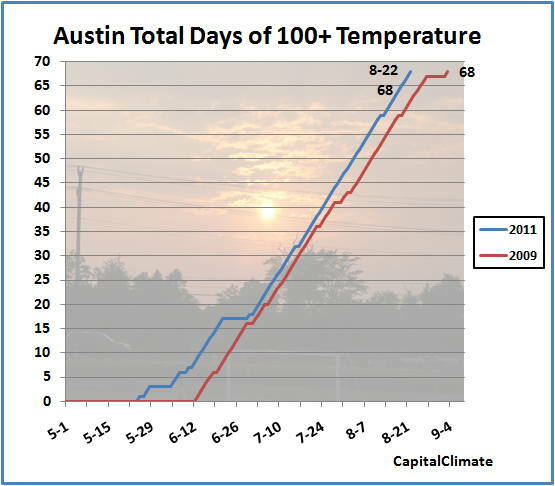 Aug. 22, 7 PM CDT Update: The Austin high today was a daily record-tying 105°, last seen in 1925. Waco has now extended its record annual total by a week, with 70 days through today. Aug. 22, 3 PM CDT Update: The Austin temperature has reached 102°, tying 2009 with 68 total days so far this year. This is just one short of the record. Aug. 15, 4 PM CDT Update: With 102° yesterday and at least 105° today, Waco has tied its annual record of 63 days with temperatures of 100° or higher. The 105° also ties the record for the date. Aug. 15, 2 PM CDT Update: [Posting and updating delayed by Comcast's second multi-hour outage in 6 days.] After hitting 105° again yesterday, Austin is back to 100° this afternoon, bringing the annual total to 61. Aug. 13, 6 PM CDT Update: The high today of 97° at Austin ends the streak at 27 days, breaking the old record by 6 days. Aug. 12, 4 PM CDT Update: The current 102° at Austin extends the record streak of 100° temperatures to 27 days and the annual total to 59. Dallas has tied its 4th highest annual total with 48 days, and Waco has tied its 2nd highest total with 61. The record streak at Waco is extended to 44 days. Aug. 11, 8 PM CDT Update: Dallas ended its streak at 40 days with a high of 97°. The high at Waco was 104°. Aug. 11, 4 PM CDT Update: Waco has broken its record streak with at least 102° and a 43rd consecutive day, but clouds have knocked Dallas back into the 80s, probably ending the streak there. Aug. 11, 3 PM CDT Update: Austin is 101° at 3 pm. 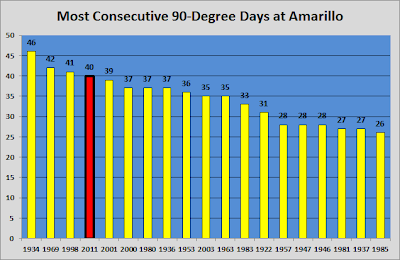 The record streak is 26 days and the annual total to date is 58 [chart updated]. Aug. 10, 3 PM CDT Update: Austin's temperature of 102° at 3 pm extends the record streak to 25 consecutive days and the yearly count to 57. Waco has now tied its record with 42 consecutive days, equal to the streak of June 23 to Aug. 3, 1980. 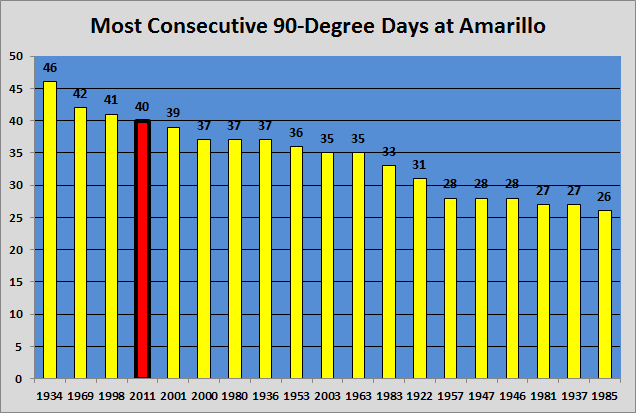 The 40th consecutive day at Dallas is still 2 short of the record. Aug. 9, 3 PM CDT Update: The Austin temperature reached 100° by 2 pm for the 24th consecutive day and the 56th day so far this year. 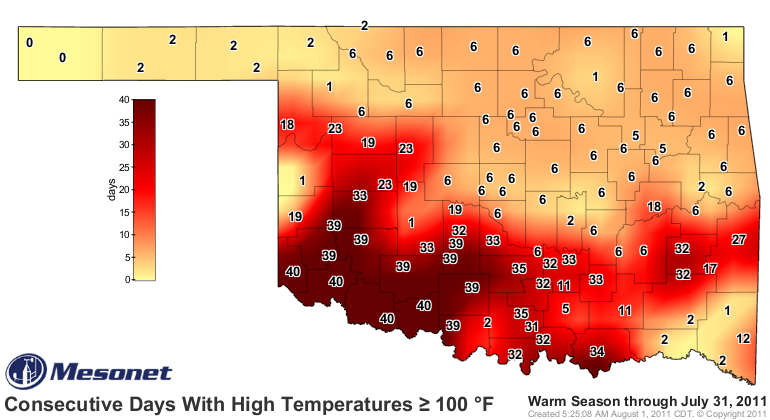 CONSECUTIVE 100 DEGREE DAYS FROM JULY 30TH TO AUGUST 8TH...2011. DAYS FROM AUGUST 1ST TO AUGUST 8TH...2011. Aug. 8, 1 PM CDT Update: With a current Austin temperature of 100°, this is now the record-breaking 23rd consecutive day of 100° readings and the 55th so far this year. Aug. 7, 3 PM CDT Update: The Austin temperature of 102° at the current hour breaks the record for consecutive days with 100° temperatures. This is the 22nd consecutive day and the 54th so far this year [chart updated]. Aug. 7, 1 PM CDT Update: Right on schedule, Austin's temperature is up 4° in the last hour to 98°, so the record for consecutive days with 100° is likely to fall in the next hour or 2. 5 PM CDT Update: The high so far today was 104°, just 1° below the record originally set in 1923 and tied in 2009. With a report of 100° as of 3 pm CDT, this is now the 21st consecutive day with temperatures of 100° or higher at Austin, Texas. That ties the record set from July 12 to August 1, 2001. It is also the 53rd 100°+ day so far this year, well ahead of the near-record pace in 2009. At this point in 2009, the total was 47. The record annual total is 69 in 1925. Highs of at least 103° are forecast for the next 7 days as well, which would bring the total to 60. Aug. 4, Midnight CDT Update: With the Dallas temperature still 92° at midnight daylight time, this morning's low of 86° is virtually guaranteed to tie the new high minimum record for the second day in a row. Breaking an all-time high minimum temperature record by 3° is remarkable enough, but after setting the record with a low of 86° on July 26, Dallas tied that record again yesterday. Waco also broke its all-time record. With a temperature of 101° as of noon CDT, this is now the 34th consecutive 100° day at Dallas. It will be the 36th consecutive day at Waco. WAS 83 WAS SET IN 1910 AND 1980. THE DATE OF 82 DEGREES SET IN 1910...1914...1930...AND 1932. Image (click to enlarge): Temperature and humidity at Ft. Smith, Arkansas for 5 days ending Aug. 3, 2011, showing all-time record hottest temperature of 114° 115°. 3 PM CDT Update: The high temperature of 113° at Ft. Smith yesterday tied the all-time record set on Aug. 10, 1936, according to NCDC. This would indicate that the earlier NWS report of a tie on Aug. 1 was incorrect. In any case, that record has just been broken with a current reading of 114°F (45.6°C). Ft. Smith climate records began in 1882. DEGREES ON JULY 31ST 1986. PREVIOUS RECORD WAS 107 IN 2010. Little Rock climate records began in 1877. The record at Topeka crushed the previous daily record for Aug. 2, set just last year, by 6°. Topeka climate records began in 1887. In addition, all-time high temperature records have also been tied at Tyler, Ft. Hood, and Longview in Texas, Ft. Smith in Arkansas, and Tulsa in Oklahoma. 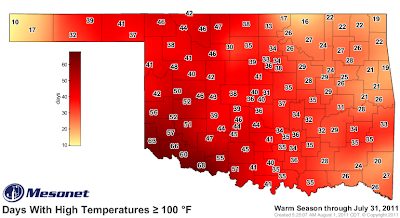 The Oklahoma Mesonet reports that July was the hottest month on record for the state of Oklahoma. The statewide average of 89.1° broke the old record by 1°. Breaking a monthly record at a single location by as much as 1° is remarkable, and doing so for the average of an entire state is even more impressive. Raleigh had 24 days in July with temperatures of 90° or higher and 9 days with 100° or higher, including a record 5 consecutive days. Record high temperatures were tied or broken on 7 days. 7 PM Update: Added chart of ratios from previous decades for comparison. As previously reported, U.S. daily high temperature records were dominating cold records in July by a ratio of over 5 to 1, based on preliminary data from the National Climatic Data Center. A surge of heat records in the final week of the month has pushed the total ratio to 6.1 to 1. For the summer as a whole (June and July combined), the ratio has increased to 8.4 to 1. This also increases the year-to-date ratio to 2.7 to 1. Out of the 1601 daily high temperature records broken in July, 49 were all-time records for any day of any month. Combined with the updated count of 20 all-time records in June, this gives a total of 69 so far this summer. In comparison, only 8 all-time cold records were set in all 3 months of last winter combined. 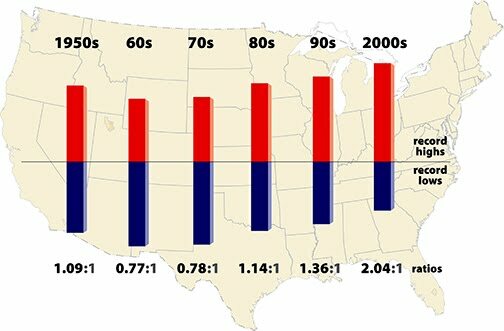 Preliminary data from ESRL/NOAA shows that nearly all of the U.S. east of the Rockies was above average (1981-2010 baseline) with the most extreme temperature values from northern Texas through Oklahoma and Kansas. 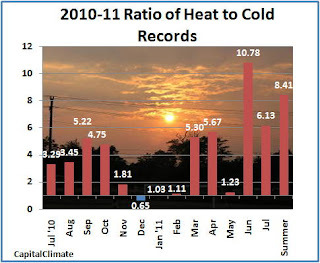 - Monthly ratios of daily high temperature to low temperature records set in the U.S. for July 2010 through July 2011. Data from NOAA National Climatic Data Center, background image © Kevin Ambrose (www.weatherbook.com). Includes historical daily observations archived in NCDC's Cooperative Summary of the Day data set and preliminary reports from Cooperative Observers and First Order National Weather Service stations. All stations have a Period of Record of at least 30 years. - Preliminary July 2011 U.S. temperature departure from 1981-2010 average from ESRL. After setting a record for all-time hottest month in June, Lubbock, Texas has duplicated that feat by setting a new record in July. This means that 2 of the hottest months in history have now occurred this year. It was also an all-time record hottest month in Childress. The 34 days with 100°+ temperatures at Lubbock so far this year now exceed the previous record year of 1934 by 5. The 66 days at Childress are in 3rd place, just 5 behind the 1934 record. The 18 days with lows of 75°+ at Lubbock have now nearly doubled the previous record of 10 in 1978 and 1966. The 36 days at Childress are in 2nd place. OCCURRED JUST LAST MONTH JUNE 2011. THE PREVIOUS HOTTEST MONTH ON RECORD WAS 89.0 DEGREES IN JULY 1934. Childress records began in 1893. July 2011 was the all-time hottest month on record at both Amarillo and Dalhart, Texas in climate records which extend back over a century to 1892 and 1894, respectively. 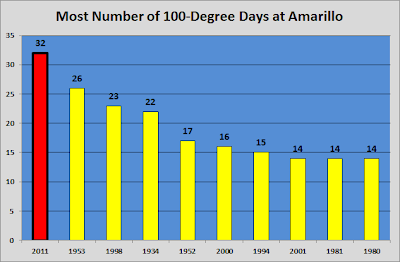 The 40 consecutive days of 90°+ temperatures at Amarillo through July 31 was the 4th longest streak in history. This has now been extended today to tie for 3rd. 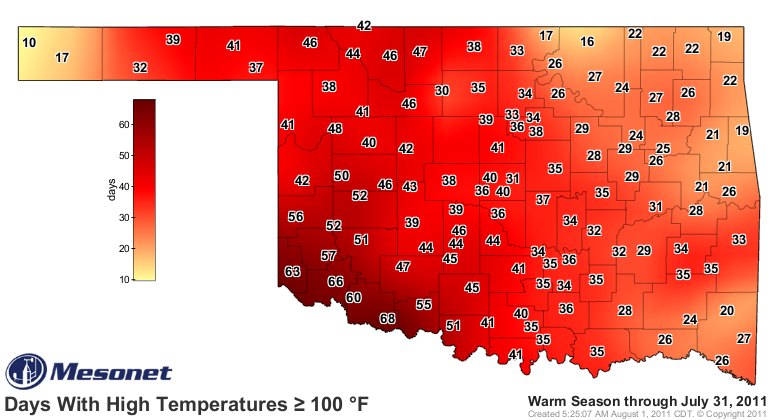 The 32 days of 100°+ have already well exceeded the previous annual record. WAS 84.1 DEGREES...SET IN JULY 1934. WAS 82.2 DEGREES...SET IN JULY 1980. July was the third hottest on record at Houston (87.1°). Combined with the hottest June on record (86.2°), the summer to date is now the hottest on record. It was also the hottest June-July at Galveston, where July was the second hottest on record. ABOVE 98 DEGREES AND 28 DAYS AT OR ABOVE 100 DEGREES. 11 PM CDT Update: The highs of 107° at Dallas and Waco both set new daily records. 4 PM CDT Update: The 106° at 4 pm has at least tied the record for the date at Dallas. The record is also tied with the same reading at Waco. It's generally not considered good forecasting practice to predict record temperatures, but 100°+ temperatures continuing into the first week of August make it likely that at least 4 of the next 7 days will tie or break high temperature records at Dallas and Waco. The 31 consecutive days of 100° temperatures which began July 2 at Dallas are now the second longest streak in history, behind Jun 23 - Aug 3, 1980. The 33 days at Waco are also in second place. The total of 38 days so far this year are tied for 9th place at Dallas. The 50 days at Waco are tied for 7th, but are only 2 away from 5th place. RECORDED TWICE...JULY 20TH 1930 AND AUGUST 6TH 1918. OR BETTER...24...IN JULY 1987 AND JULY 1993. 93.6F BEAT THE PREVIOUS RECORD OF 92.8F SET IN JULY 1999. 75.4F BEAT THE PREVIOUS RECORD OF 73.9F SET LAST JULY 2010. TEMPERATURES STAYED AT OR ABOVE 80F IN WASHINGTON DC...7. 101F ON THE 29TH...OR TIED...102F ON THE 23RD. OR BETTER...22...IN JULY 1988 AND JULY 1999. 92.9F BEAT THE PREVIOUS RECORD OF 92.5F SET LAST JULY 2010. IN 1936 ON JULY 10TH. A NEW DAILY HIGH MIN TEMPERATURE RECORD OF 81F WAS SET ON THE 22ND. 1993. RECORDING KEEPING AT DULLES BEGAN IN NOVEMBER 1962. 103F ON THE 29TH...OR TIED...99F ON THE 23RD. OR BETTER...21...IN JULY 1987...JULY 1988 AND JULY 1999. 92.8F BEAT THE PREVIOUS RECORD OF 92.5F SET LAST JULY 2010. One often-repeated claim is that global temperatures are not warming because they were higher in the 1930s. Aside from the fact that this is a U.S.-centric argument based on the extreme temperatures in the Midwest and Southern Plains during the Dust Bowl years, it simply isn't true. This fact is being hammered home even more vigorously with the record-setting heat wave of 2011. July is closing out with all-time record hot monthly temperatures from Austin to Washington, as well as many points in between. 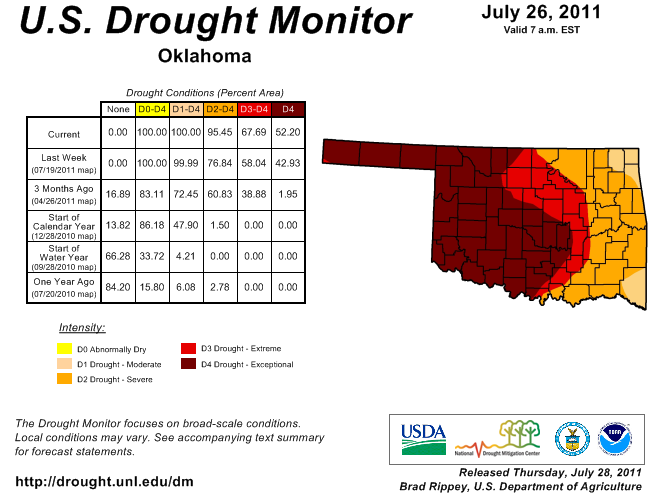 One location in the heart of the Dust Bowl, Oklahoma City, is finishing its hottest month on record. 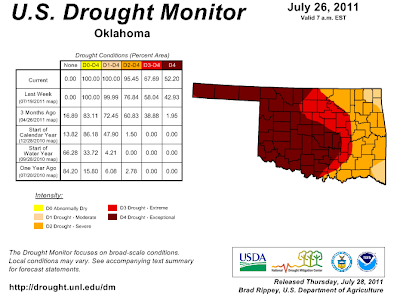 According to preliminary data from the National Weather Service, the July average temperature through the 30th of 89.2° is enough to ensure that the month will exceed the previous all-time hottest month of August 1936, which had an average of 88.7°. This is also well above the previous hottest July average of 88.3°, which was set in 1934 and tied in 1980. Wichita Falls is also completing its hottest July on record. ENOUGH TO AFFECT THE VALUES. WILL BREAK THE RECORD FOR THE WARMEST JULY ON RECORD. ZERO RAINFALL, WHICH OCCURRED BACK IN 2003. AUSTIN MABRY AND AUSTIN BERGSTROM BOTH HAD 0.05 INCHES OF RAIN. JULYS OF RECORD AT DEL RIO OR SAN ANTONIO. Just 2 years after setting the record for all-time hottest month in July 2009, preliminary data from Austin indicate unofficially that this month's average temperature of 89.7° will set another new record. With today's high of 102°, only 2 days this month (the 1st and 16th) have failed to reach 100°. 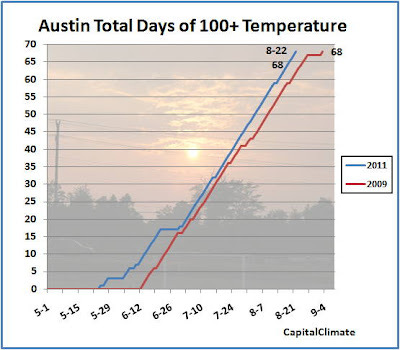 This record hottest month immediately follows the second hottest June in Austin history.